08 September, 2015 – Air Transat, Canada’s leading leisure airline, is introducing a new service from Glasgow to Montréal for summer 2016, with flights from just £385 return per person (including taxes and other charges). The new weekly service will be operated on an Airbus A310 aircraft, departing Glasgow on Mondays from 30 May, returning every Sunday until 2 October 2016, connecting the two cities for the first time and unlocking the entire province of Quebec for Scottish travellers. Montréal, the largest city in Canada’s French-speaking Quebec province, combines old-world charm with contemporary North American energy to create a unique atmosphere. A trip to Montreal also provides an excellent opportunity to visit the whole province not least the provincial capital, historic Quebec City. 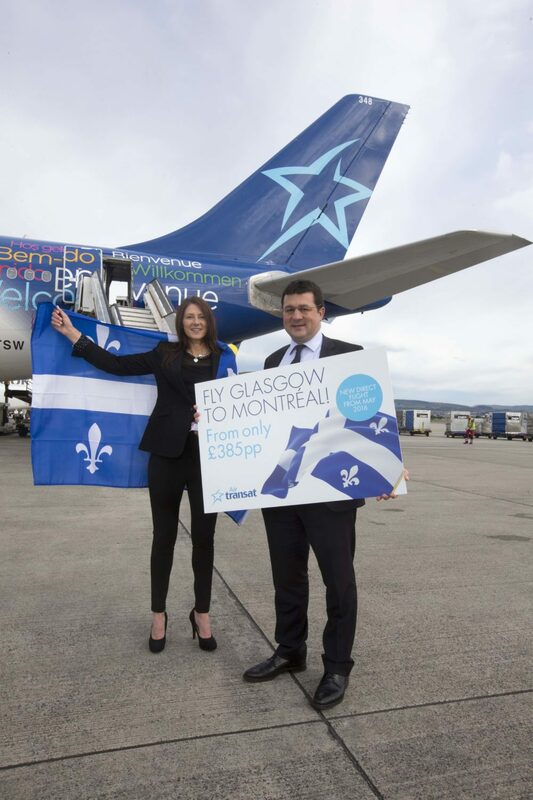 Lesley Kane, Sales Director UK & Ireland, Air Transat, commented: “We’re delighted to be launching this a new route for Scottish passengers, and we are sure this service will be very popular as there is a deep historic connection between Scotland and Quebec. “Our new non-stop service to Montréal brings our Scottish connections to four great Canadian cities, and adds to Toronto, Calgary, and Vancouver which have been Air Transat staple destinations for over 20 years. “We also look forward to welcoming more Canadian passengers into Scotland on our new service and we will be working closely with VisitScotland, Glasgow City Marketing Bureau as well as Glasgow Airport to make our new service well known”. Minister for Transport and Islands Derek Mackay said: “This is excellent news for business and leisure travellers and I congratulate both Glasgow Airport and Air Transat on this announcement. Commenting on the new route, Councillor Gordon Matheson, Leader of Glasgow City Council and Chair of Glasgow City Marketing Bureau, said: “Canada is the third largest international market for Glasgow and Air Transat’s decision to add Montréal to its portfolio of existing direct routes into Glasgow will further strengthen our connections in this key territory and also presents us with the opportunity to increase French Canadian visitors to the city. 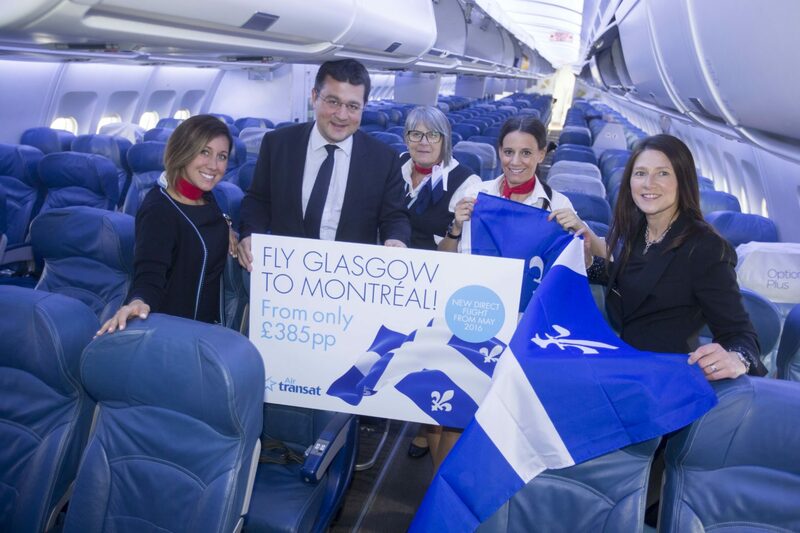 Mike Cantlay, OBE, Chairman of VisitScotland said: “We welcome this new Air Transat route from Montréal to Glasgow which will encourage visitors from across Quebec to fly directly to Scotland. With some 4.7 million Canadians having Scottish ancestry, and around 100,000 Canadians of Scots origin in the Montreal area, Canada represents a diaspora stronghold. Air Transat’s investment presents a great platform for the tourism industry in Scotland to tap into an ancestral market”. Air Transat customers will have the choice of five weekly flights from Glasgow to Toronto in summer 2016, along with a weekly direct service to Vancouver and Calgary. Further weekly connections can be offered to Montreal, Vancouver and Calgary through Air Transat’s connecting flights (operated on Boeing 737) at Toronto and Vancouver. This allows more flexibility on holiday durations in Canada to Scottish passengers. Customers can select from two cabin classes – Economy and Club Class (a separate 12 seat cabin). Option Plus can also be added to an economy ticket to add more benefits and enhancements to an economy ticket. Air Transat also offer a range of economy fares to allow for greater flexibility, passengers can choose from Eco, Eco Extra and Eco Max tickets, full details available online. The airline has upgraded its on-board passenger experience, introducing a service where passengers travelling on its A310 aircraft can access entertainment including films, TV shows and music through their own personal tablets, smartphones (IOS and Android) and laptops.